Understanding Immunomodulation by MSCs: Follow that Monocyte! The intravenous infusion of mesenchymal stem cells (MSCs) commonly leads to rapid cell entrapment and death in the microvasculature of the lungs; however, MSCs still display powerful immunomodulatory capabilities within this short timeframe and, therefore, still hold significant therapeutic potential . While soluble factor exchange and cell contact-dependent processes represent likely mediators of immunomodulation, the exact mechanisms of action remain unclear . This knowledge gap led researchers from the lab of Martin J. Hoogduijn (Erasmus MC, Rotterdam, Netherlands) to undertake an in-depth study of human umbilical cord MSC infusion in a mouse model. Excitingly, de Witte et al. discovered that monocytes of the innate immune system determined the effect of MSCs by rapidly mediating, distributing, and transferring their influence from the lungs through the bloodstream to distant body sites, and in particular the liver . To understand immunomodulation by MSCs, this new STEM CELLS study suggests that we follow that monocyte! The authors employed a dual tracking strategy (Qtracker beads for viable cells and Hoechst33342 to stain all cells) to monitor the spread of human umbilical cord MSCs following intravenous infusion in a mouse model. While viable cells accumulated in the lungs immediately following infusion, MSCs died soon afterward (24 hours), and the study subsequently detected dead MSCs within monocytic cells in the lungs and the liver but also disseminated throughout the body, suggesting passage through the bloodstream. Subsequent in vitro analyses established that classical-inflammatory monocytes phagocytosed MSCs and promoted the polarization to a non-classical-anti-inflammatory phenotype. This shift induced multiple immunomodulatory characteristics, such as the increased expression of programmed death ligand-1 (suppresses the immune system) and interleukin-10 (an anti-inflammatory cytokine) , the reduced expression of TNF-α (an inflammatory cytokine), and the induced formation of Foxp3+ regulatory T cells (part of the adaptive immune system). 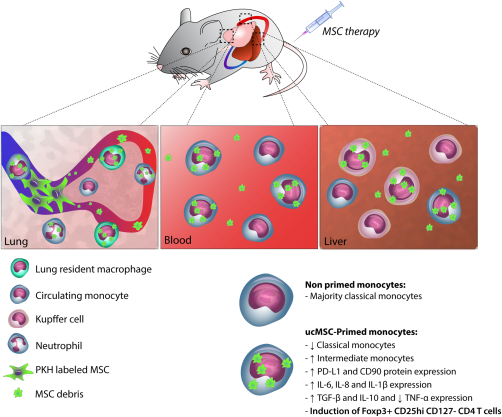 Together, this data suggests that monocytes play a crucial role in mediating, distributing, and transferring the immunomodulatory effect of MSCs; a key consideration for MSC infusions in disease models and clinical trials. The authors hope now to identify the specific MSC components that induce monocyte polarity alterations to create a cell-free immunomodulatory therapeutic to treat tissue damage, inflammatory disease, and autoimmune disorders. To follow all the studies on monocytes and the immunomodulation by MSCs, stay tuned to the Stem Cells Portal. What mechanisms are likely to play important roles in monocyte polarization by MSCs? How close are we to an effective, defined cell-free immunomodulatory/anti-inflammatory therapy? What influence will these new findings have on MSC infusions in disease models and clinical trials? Gao F, Chiu SM, Motan DAL, et al., Mesenchymal stem cells and immunomodulation: current status and future prospects. Cell Death &Amp; Disease 2016;7:e2062. Eggenhofer E, Luk F, Dahlke MH, et al., The Life and Fate of Mesenchymal Stem Cells. Frontiers in Immunology 2014;5. Witte SFHd, Luk F, Parraga JMS, et al., Immunomodulation By Therapeutic Mesenchymal Stromal Cells (MSC) Is Triggered Through Phagocytosis of MSC By Monocytic Cells. STEM CELLS 2018;36:602-615. Deng Y, Zhang Y, Ye L, et al., Umbilical Cord-derived Mesenchymal Stem Cells Instruct Monocytes Towards an IL10-producing Phenotype by Secreting IL6 and HGF. Scientific Reports 2016;6:37566.